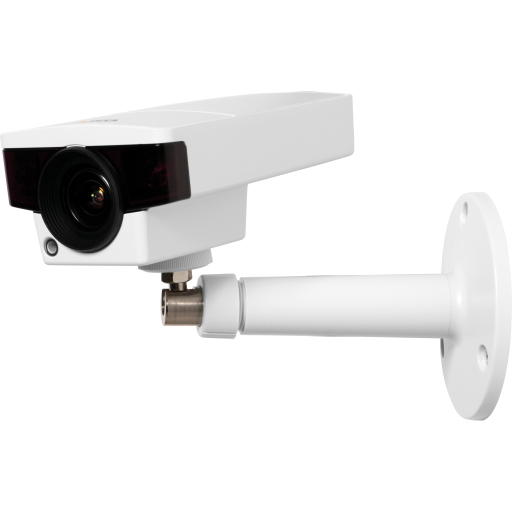 AXIS M1145-L Network Camera is an affordable and compact fixed camera, perfectly suited for boutiques, restaurants, hotels and offices or other places where surveillance is required during day and night. AXIS M1145-L with board-mount, varifocal, P-iris lens provides excellent image quality at 30 frames per second in 2 megapixel / HDTV resolution. The P-iris control provides optimal depth of field, resolution, image contrast and clarity. The cost-effective, compactly designed camera offers multiple H.264 and Motion JPEG streams that can be individually optimized for bandwidth and storage efficiency. The camera supports digital pan/tilt/zoom, which allows a view cropped from the full view to be streamed for viewing or recording. AXIS M1145-L offers Axis OptimizedIR, a power-efficient LED technology that provides an adaptable angle of IR illumination and discreet integration of IR LEDs, the cameras provide automatic illumination of a scene in complete darkness, at an event or when requested by a user. The IR LED illumination which is invisible to the human eye, is perfect for discovering objects in a range of up to 15 meters (50 ft). AXIS M1145-L offers support for edge storage that allows recording video directly to a storage such as an microSD/SD/SDHC card, thereby creating a flexible and reliable video surveillance system. Power over Ethernet supplies power to the camera via the network, eliminating the need for power cables and reducing installation costs. AXIS M1145-Lalso offers remote zoom and focus that eliminates the need for hands-on fine tuning and ensures that the camera’s angle of view is optimized for the area to be monitored.